A good education must help the young generation to think, not to follow without thinking and imitate. 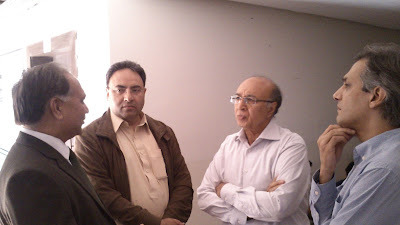 Mr. Tanvir Shahzad, Journalist, Mr. Amjad Ali, Journalist from Voice of Germany (VoG), Mr. Omar Hassan, Architect Professor BNU and Prof. Dr. Norbert Pintsch, from SES met in BNU on 29 October 2015. During the meeting in BNU, many interesting subjects of mutual interest were discussed: Mud House Project with three experimental houses, financed from German Government, Production of diplomas in architecture in the time between present fashion and change in architecture through 3D-plotter, About the impotence of leaders to understand the 21st century needs, the bona fide to belief Time is Money and the tale it has to be profitable in society, the belief in economical tales demolish a society and the education is a brave helper. 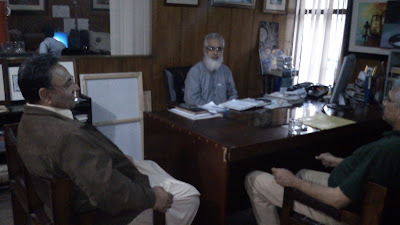 Team of SPARC-project including Mr. Anees Yaqub, Artist, Mr. Amjad Ali, Journalist Voice of Germany (VoG) and Prof. Dr. Norbert Pintsch from (not on picture) met to discuss communication and information and how to create awareness about the difference between urban and rural area needs. The NGO A.F.A. is working successfully since over 29 years. In order to develop the project further, an application for support was made to the Japanese embassy in 2004 for the purpose of establishing a School of Home-Economics in the TGD village next to the village school. Due to the massive earthquake however, all funds were diverted to the rehabilitation of earthquake victims so the application remained inconclusive. In the meanwhile, a requirement for overnight stay is increasingly felt for regular student groups, which visit the village, also to witness the use of alternative energy techniques in the village as well as the cooperation of the village NGO with universities in Lahore regarding mud construction techniques. Three experimental construction samples were set up at the Peerzada Cultural Complex, three further samples and two flood water shelters at the Beaconhouse University. The experience gained in these trials has led to the conclusion, that a Bio-Gas unit should be installed at the planned construction site in order to give access to thy farmers in the village to alternative technology. The planned building consists of a ground floor ventilation area, which can be used by the neighboring residents as cattle keeping area as well as for the installation of the Bio-Gas unit. Outsiders reach the rooms level via a bridge leading from the road to the building. In this way, the visitors as well as the farmers do not disturb each other. 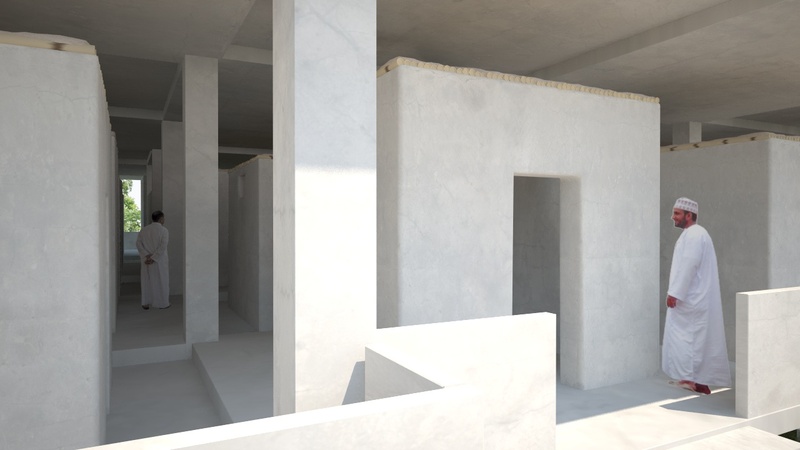 The rooms level is supported by a steel-concrete construction with different heights fixed with supports. The different levels of construction aid the air circulation; the rooms are located a little apart from each other, which also supports the ventilation. A staircase leads to the next level. The rooms are made of mud walls. These are protected from rain by the elongated roofs. The room ceilings are made of bamboo material, so that the bamboo roof and the steel concrete roofs are separated from each other for thermal reasons and air can circulate easily between them. The planning office in Lahore will make the basic design. It is intended to integrate students of universities in Lahore into the project. The main aim of the project is to demonstrate the use of climate friendly construction materials. 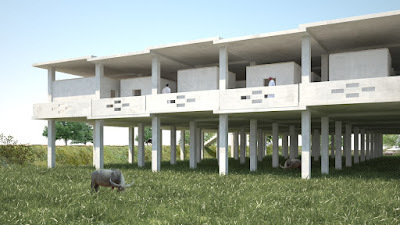 The use of mud as construction material and alternative energy techniques will show a way for the future. Also the location of the one-room houses is to be done in a climate friendly manner and air circulation is to be promoted through some distance between them. The ground floor provides the farmers with a secure place to keep their cattle and also a location to fix the Bio-Gas unit. The Bio-Gas unit will be used by the upper level rooms and by the villager families living near the ground level. The lighting in the compound will be provided by the photo-voltaic unit installed on the roof top.